I'm interested in Wirecast Gear 210. The problem I have is the following: I need to have predefined titler, one per person for a conference. When authorization is given to use the microphone to a person, a specific titler must be activated: making the operator's work faster. I have 40 people per conference, I must select a position of a camera PTZ (which I have a result) and the titler of the person who is going to speak. The query is, can I automate that when I activate a microphone send some command to the wirecast so that it uses the corresponding titler in Wirecast? Can I program some interface to interact and solve this? You can build all the titles in advance and create a shot for each. I'm not sure what kind of automation you're thinking of since it takes a human to see the face and identify a name. All titles and shots can be built in advance though. Select Mic, camera, title all in one shot for each speaker. 40 people. 40 shots. I need it for a room for legislative sessions. 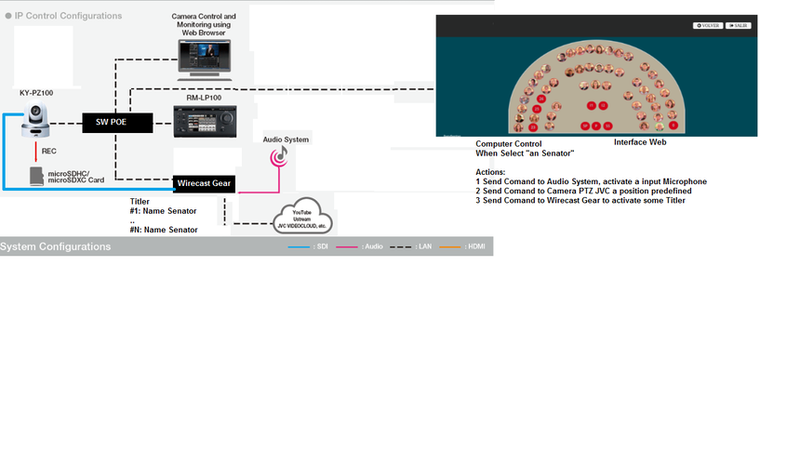 I have an audio server with a Web interface that controls each seat by enabling the corresponding microphone. What I need now is when the microphone is enabled, the position of corresponding camera in the preset position (they are IP cameras) and add the videograph with the data of the senator taking . I want to automate the videgraph in order not to have an operator continuously seeing which senator is talking. leandro I"m not sure how the system can intelligently pick the correct title. Perhaps you can script it. Wirecast can be controlled by script but you'd still be calling up the titles as shots and the "thing" controlling the script would have to know which shot to call up. It may depend on your audio and video detection system. I give you a diagram of how the system would be. I need to control the videograph or title that shows the name of the Senator who will be speaking. Nose if in the script you can detect the movement of a camera and automatically you can select the corresponding shot or that you could program in the script: before which event to perform such an activity. Thank you very much for the help. leandro You would have to use whatever system you have to detect movement and call the correct title. Wirecast itself doesn't have motion detection. Given the nature of the technology that would have to be coming from your backend system. For example, your X, Y coordinate could call Title #3 if you can do the backend scripting. 1- In my microphone control system, I select a senator who will speak. 3- Sending # 2 (from my control computer) to the corresponding chamber that moves to position X, Y (Resolved). 4- Sending # 3 (from my control computer) to WirecastGear so that it executes a script that calls Title #X. The idea is to generate a process in the operating system that receives the request and calls the script. I am right? Basically yes. The script can call specific shots so that one thing triggers Title for Senator A and another triggers Title for Senator B, etc. And finally, I can install a web server: for example apache or internet information server? Because the Web Server, control computer, could leave it inside the Wirecast. The operating system has limitations or I can install certain applications. leandro You should be able to install a webserver without issue as long as the computer can handle the workload.